This weekend we hosted T's family at our house. It's great to finally have a house big enough to host his whole family without someone having to stay in a hotel or on an air mattress. 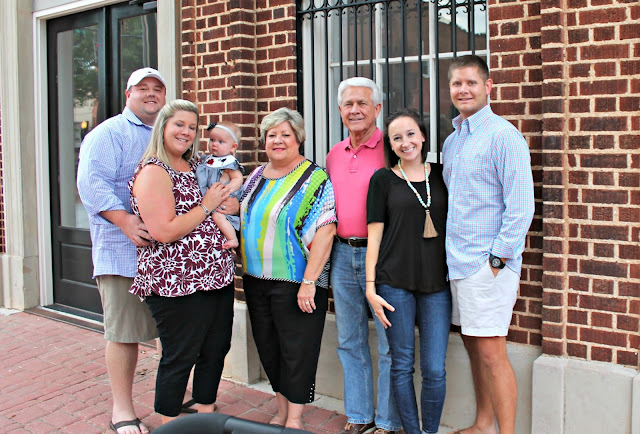 We loved our 2 bed 1 bath bungalow, but hosting family in it was always tough. 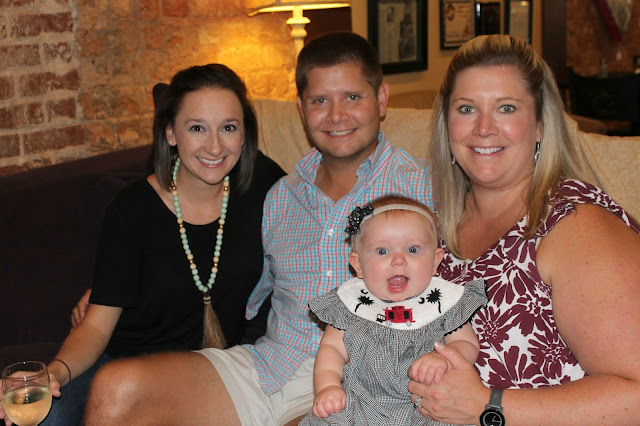 T's sister and her husband have the sweetest little 6 month old, Caroline. Not only is she precious, but she's the most easy going happy baby I've ever seen. We loved getting to spend time with her this weekend. Friday night we took it easy and had burgers on the grill. I served them with slaw and these potatoes which were quite a hit. Saturday's schedule was dictated by what football games were on, but we ladies were able to escape for a few hours to do some shopping at Charleston Cooks. On Saturday night we headed to downtown Greer for drinks and dinner. 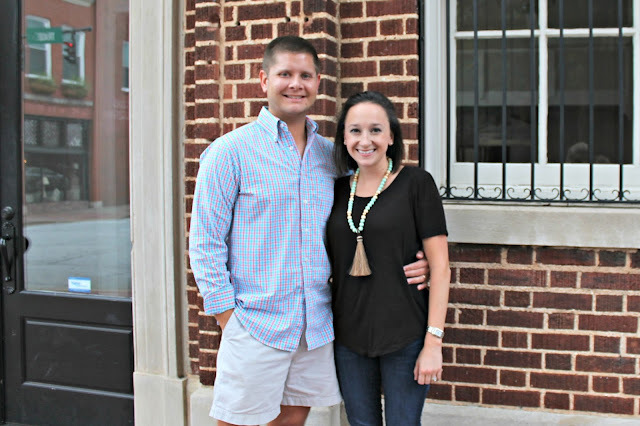 We're still very close to downtown Greenville, but it was fun to go into the quaint downtown of Greer for a change. 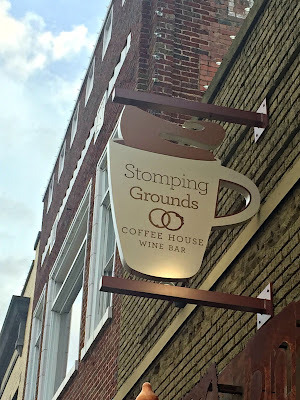 We first stopped at Stomping Grounds for some beer and wine before dinner. This place was so cute inside. They had couches and tables all around, board games to play, and a band was setting up just as we were leaving. It's a coffee shop during the day, and at night it turns into a wine bar. They also had a really good looking brunch menu, to T and I plan to return soon for a weekend brunch. After drinks, we walked up the street to dinner at the Great Bay Oyster house. Dinner was pretty good. Not the best seafood I've ever had, but pretty good. T ordered oysters and said they were very fresh. I had a Catch of the Day sandwich, but probably should have gone for the oysters. 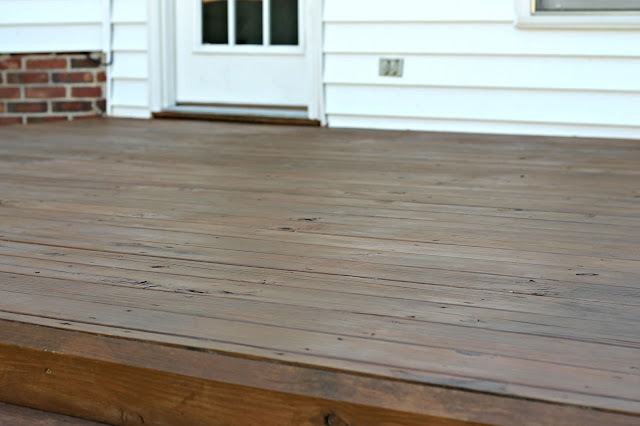 On Sunday, I got the bright idea that I wanted to stain seal our deck. The weather was so beautiful outside, and I figured I might as well take advantage of the cooler temps to get some outdoor work done. Our deck had decades of dirt and grime built up on it. Thankfully T took several hours last weekend to clean it, so that part was already done. 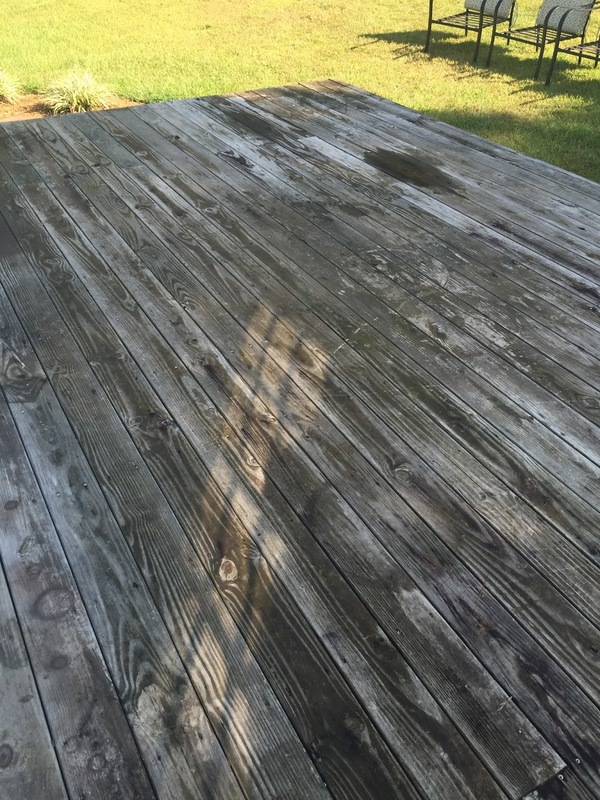 Four hours and a can of wood stain and sealer later, the deck looked almost brand new. I was shocked at how much better it looked!